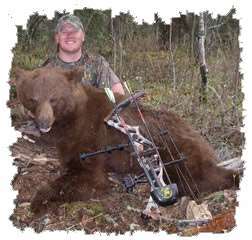 Silver Fox Outfitters of Yellowhead City, Alberta Canada has donated a 3 day, 2 on 1 bear hunt for 1 hunter for the Spring 2019 season. The spring season begins on May 6, 2019 and ends June 9, 2019. Second bear can be added for $750. Accommodations include tent. Extra days can be added for $350/day. The license fees for bear is $400, wolf $150. Trip arrival and departure point is High Level, Alberta, Canada.